Eric Fonoimoana gave American beach volleyball fans one of the greatest moments in the sports history when he teamed with Dain Blanton to win a gold medal at the 2000 Olympics in Sydney, Australia. Before the Sydney Games, he and Blanton had won tournaments domestically on the AVP Tour, but they’d never finished first in an international event. Clearly, they played their best went it counted most. Fonoimoana, who has 15 career pro beach titles, now coaches juniors players in beach volleyball, and we asked him recently to share some tips on how players can be mentally tough for competition. 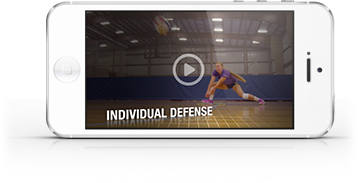 In the video you’ll see here, he covers a number of topics, including preparing for your opponent, moving on from the last play, calming down mid-match if you’re upset, improving your weaknesses, attacking your opponent’s weaknesses and challenging yourself in practice. You can also check out Part 2 of our interview with Eric, where he talks about doing brain workouts with a device called “Versus,” which allows you to play video games on an iPad by detecting your brain waves with sensors. For instance, you might be racing a car, but you’re controlling the speed and movements with brain waves, not with your hands or feet. Interesting stuff!